Galway 3-3 Mayo 1-6 (Tuam Stadium, 1/2/1953). MAYO: M O’Malley; J Forde, W Casey, S Flanagan; J Staunton, F Fleming, P McGowan; J Nallen (0-1, ‘50’), P Carney (0-3, one free); S O’Donnell, P Irwin, M Loftus; M Flanagan (1-0), T Langan, JJ McGowan (0-2). Sub: C Mulderring for Staunton. PLAY-OFF: Kerry 2-5 Mayo 0-9 (Austin Stack Park, Tralee, 29/3/1953). MAYO: S Wynne; J Forde, W Casey, S Flanagan; F Fleming, H Dixon, J McAndrew; P Irwin, J Nallen; S O’Donnell, P Carney (0-8), E Moriarity; M Flanagan, T Langan (0-1), P Solan. Subs: P Prendergast for Dixon, M O’Malley for Wynne. SEMI-FINAL: Sligo 1-6 Mayo 2-6 (Corran Park, Ballymote, 28/6/1953). 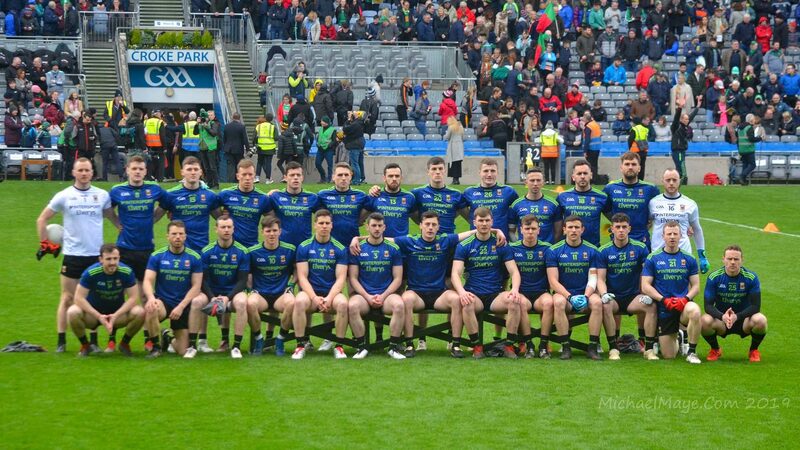 MAYO: S Wynne; J Forde, P Prendergast, S Flanagan; F Fleming, H Dixon, J McAndrew; J Nallen, P Irwin; T Henry, P Carney (1-3, one point a‘50’), M Mulderrig (0-1); M Flanagan, E Mongey, J Gilvarry. Subs: E Moriarty for Dixon, P Solan (0-1) for Gilvarry, S O’Donnell (1-1) for Henry, W Casey for Prendergast. FINAL: Roscommon 1-6 Mayo 0-6 (St Coman’s Park, Roscommon, 19/7/1953). MAYO: S Wynne; J Forde, W Casey, S Flanagan; F Fleming, J McAndrew, E Mongey; P Carney (0-3, frees), J Nallen; S O’Donnell, T Langan, E Moriarty; M Flanagan (0-1), P Solan (0-2), M Mulderrig. Sub: J Gilvarry for Mulderrig. Longford 0-5 Mayo 4-9 (Pearse Park, Longford, 11/10/1953). MAYO: M Corkery; J Forde, W Casey, S Flanagan; F Fleming J McAndrew, E Moriarity; J Nallen, P Irwin (0-1); S O’Donnell (2-0), P Carney (0-4), J McVey; M Flanagan, D O’Neill (2-2), JJ McGowan (0-2). Sligo 1-1 Mayo 1-10 (Corran Park, Ballymote, 8/11/1953). MAYO: M Corkery; S Downes, W Casey, S Flanagan; F Fleming, E Moriarity, F Cox; P Irwin (0-1), J Nallen (0-1); S O’Donnell, P Carney (0-4, one free), JJ McGowan (0-3); T Langan, D O’Neill (1-0), P Solan (0-1). Mayo 3-6 Leitrim 3-4 (Fr O’Hara Park, Charlestown, 22/11/1953). MAYO: M Corkery; S Downes, W Casey, S Flanagan; M Deasy, F Fleming, F Cox; J Nallen, P Irwin; E Mongey (0-2), P Carney (2-3), JJ McGowan; T Langan (1-0), S O’Donnell, P Solan (0-1). Sub: D O’Neill for S O’Donnell. SEMI-FINAL: Sligo 0-5 Mayo 2-10 (Corran Park, Ballymote, 28/6/1953). MAYO: S Stewart; P Gavin, J Veldon, A Slattery; W Joyce, B Keane, J Jennings (0-1); D Keane (0-1), M Stewart (0-3, two frees); E Nealon (1-0), S Freyne (0-3), V Blythe (0-1); V Kilcullen, E McTigue (0-1), E Walsh (1-0). FINAL: Roscommon 1-3 Mayo 1-9 (St Coman’s Park, Roscommon, 19/7/1953). MAYO: S Stewart; P Gavin, J Veldon, F Fahy; W Joyce, J Jennings, B Keane; D Keane, M Stewart (0-1); V Blythe, S Freyne (0-3), T Treacy; V Kilcullen (0-2), S Gallagher (1-0), E Walsh (0-3). SEMI-FINAL: Mayo 5-2 Armagh 1-5 (Pearse Park, Longford, 30/8/1953). MAYO: S Stewart; P Gavin, J Veldon, P Fahy; T Treacy, B Keane, E Walsh; D Keane, M Tuohy; M Stewart, S Freyne (2-1), V Blythe; V Kilcullen (1-0), C McDonnell (1-1), S Gallagher. Sub: E Nealon (1-0) for Gallagher. FINAL: Mayo 2-11 Clare 1-6 (Croke Park, 27/9/1953). MAYO: S Stewart; P Gavin, J Veldon, P Fahy; W Joyce, J Jennings, B Keane; D Keane (1-4, penalty goal and four frees), M Stewart (0-2); E Nealon (0-1), T Treacy (1-3), V Blythe; V Kilcullen (0-1), C McDonnell, E Walsh. Sub: M Tuohy for Jennings.